“Today, the Senate finally confirmed Loretta Lynch to be America’s next Attorney General — and America will be better off for it,” former President Barack Obama proclaimed after Loretta Lynch sealed her place in history. Looking back, it almost reads like a sad joke after everything we’ve come to witness as a nation. Loretta Lynch, former U.S. Attorney General under Obama, has made a habit of landing herself in sticky situations time and time again. This time, however, it looks like the dirt might actually stick. From the beginning of her rise to national politics, Lynch was a controversial figure. Her Senate nomination vote for Attorney General was the closest in history (until Jeff Sessions’ came along in 2017), with a final tally of 56-43. Before long, it became apparent that the Justice Department would be moving even further in a direction that was oppositional to law enforcement. She caused even further controversy when she directly lied to the LGBT community in Orlando regarding Omar Mateen’s motivation in killing forty-nine people at the Pulse nightclub. “We stand with you,” Lynch said right before she told mourners that a motive may never be known. Rather than telling the truth, Lynch directed the FBI to edit a transcript of the Orlando 911 call in which the perpetrator declared and directly linked himself to the Islamic State. With all references to ISIS were removed, is there any doubt of the Department knowing exactly what Mateen’s motive truly was? The lies they told the LGBT community in Orlando are flat-out inexcusable. The only reason that the unedited transcript was ever made public is that Republicans in D.C. smelled blood in the water and demanded it be released. These lies should have served as a sign of what was to come from Loretta Lynch, and now it appears 2016 will be the one topic that Lynch will blame for her downfall in the future. The scandal began on June 27th, 2016, on a tarmac in Phoenix, Arizona. Loretta Lynch chose to meet with former President Bill Clinton, the husband of Hillary Clinton, on his private jet while his wife was under formal investigation by the Dept. of Justice. 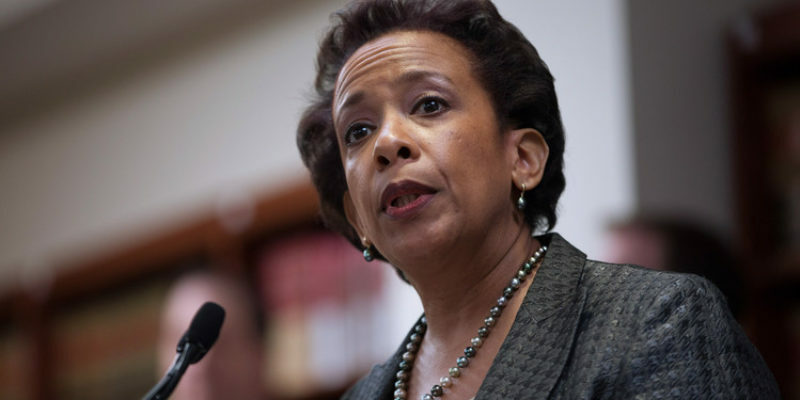 What was spoken on that plane largely remains a mystery; Lynch insists that the two only spoke about topics that were not germane to any active investigations. However, the image of the sitting Attorney General meeting with the husband of a suspect who’s under investigation spread far and wide, calling into question the integrity of not only the Dept. of Justice, but also Loretta Lynch. Since that day things have only gotten worse. While the Clinton investigation was eventually closed by FBI Director James Comey (and then opened again by James Comey, and then closed yet again by James Comey), Lynch has been forced to testify before Congress on these issues and more. Lynch left office with a shadow over her head- a shadow that still persists, ironically, due to James Comey. While Democrats hoped that now-former FBI Director James Comey would provide proof of President Trump’s obstruction of justice in the Mike Flynn/Russia investigation, the bigger story that broke detailed how Loretta Lynch had directed Comey to refer to the Clinton investigation as a “matter” and not as an “investigation.” According to Comey, “that was one of the bricks in the load that led me to conclude, ‘I have to step away from the Department if we’re to close this case credibly.’” This has raised the following questions: did Loretta Lynch knowingly interfere in the investigation of Hillary Clinton? Furthermore, did she collude with Clinton’s campaign to do so? The answer, as it appears, would be yes to both questions. According to a report by The New York Times, the FBI came into the possession of multiple documents, including one from a “Democratic operative who expressed confidence that Ms. Lynch would keep the Clinton investigation from going too far.” The Washington Post further corroborated this article, even providing that the information came from an email from Representative Debbie Wasserman Schultz, the former head of the Democratic National Committee. That email stated that Lynch had told Clinton campaign staffer Amanda Renteria that the investigation wouldn’t “go too far.” This, along with Comey’s testimony, has caused the Senate Judiciary Committee to launch a bipartisan investigation into Loretta Lynch’s activities. What will be unveiled by this investigation is going to be interesting, to say the least. Perhaps, we will finally discover what was really said on that plane in Phoenix? Perhaps, we will learn more about just how involved the Clinton campaign was with their candidate’s investigation by the FBI? It is humorous how this scandal has come out of the woodwork. The Democrats, insistent on removing Donald Trump from office, crafted a narrative that the Trump campaign colluded with the Russian government in order to elect Trump to the presidency. When this narrative didn’t stick with the American people, they attempted to work an obstruction of justice charge into the narrative, only to have Comey’s testimony fall flat and expose Loretta Lynch for the obstruction that they attempted to have put on Trump. Rather than collusion between Trump and Russia, now we find collusion between the Obama administration’s Justice Department and the Clinton presidential campaign. The irony should not be lost on the American people that in attempting to end Trump’s presidency, the Democrats have exposed themselves for the very behavior they accused Trump of. If you really sit back and think about, should we even be surprised at this point?